Karathe Chips is a recently learned recipe. In Konkani, Karathe means bitter gourd (bitter melon). This is a very easy recipe and requires only few ingredients (and of course they taste awesome). Hence I instantly fell in love with it. I am glad that I was able to learn it from my SIL. This was my first try in making it and they turned out just as she had made them. We enjoyed every bit of it. Wash the bitter gourd and chop off its end. Then make thin slices of it. Then remove the seeds from each slice and put them in a bowl. Now sprinkle with generous amount of salt and give a gentle mix. Let it rest for 4-5 hours (I kept it over night). Now discard the liquid that has accumulated in the bowl. Then add the rice flour, red chilli powder and salt (only if required) and mix it well. Sprinkle little water at a time so that the flour coats the bitter gourd rings (mix it gently such that the rings do not break and all of them gets a coating). Meanwhile keep the oil for heating. When the oil is hot, add each coated bitter gourd rings and fry them (in batches) until they turn golden brown and crispy. Then put them on a paper towel to drain excess oil (I fried them in four batches). Store them in an air tight container, once they cool. Above measurement serves 2-3 people and stays good upto a week. 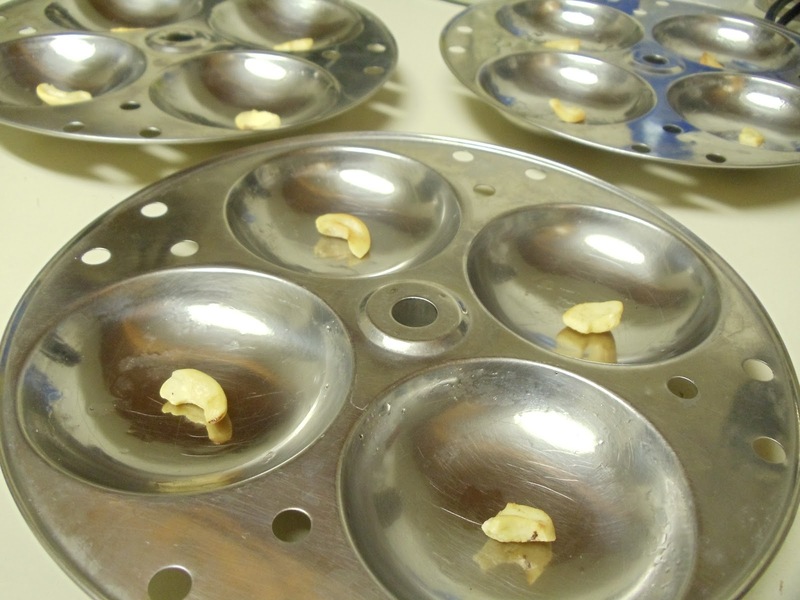 *The amount of jaggery required completely depends on how sweet the jackfruit is and how much more sweet you want. The jackfruit I used was mildly sweet. I like my dosas very sweet. Hence added more jaggery (nearly 1/3 cup). 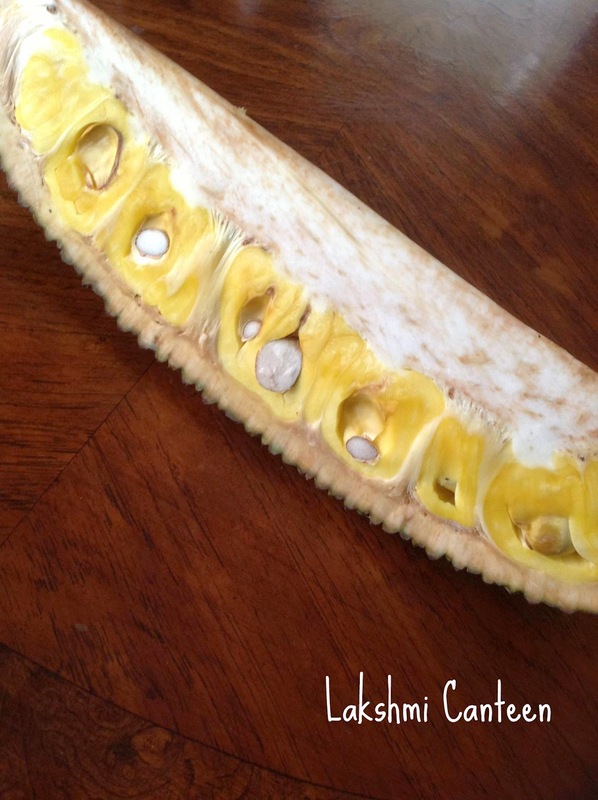 Remove the jackfruit pods and discard the seeds. Now drain the water in which the rice was soaked. Transfer the rice along with chopped jackfruit, jaggery, cardamom pods and salt (you can also add the grated coconut too but I like to add to the batter to give it a nice texture). Then grind it without adding water to get a fine paste. At this point taste the batter to check for its sweetness. If desired add more and grind it further. Now transfer this paste to a bowl and add grated coconut and mix well. Add water in small quantities to get a thick batter but of pouring consistency (the batter has to be used immediately. If not, refrigerate it). Now heat a griddle (tawa) on a medium flame. When hot pour a ladel full of batter and spread it slightly (these dosas are generally thick and soft and they need to be cooked on a gentle heat. The dosa will burn on a high heat as it has jaggery in it). Once the lower part of the dosa turns golden- brown, flip it. Wait till it gets golden- brown spots on the second side. Once done transfer it to a plate. Serve it immediately with generous drizzle of ghee. Above measurement serves 2-3 people. *You can also use cauliflower or mushroom instead of baby corn. Cut each baby corn into two pieces. Also chop onions and slice garlic pods. Then cut the bell pepper into thin strips. Now prepare the batter. Take all purpose flour, corn flour, ginger- garlic paste (I used fresh) and salt in a mixing bowl. Add water in small amounts to make a thick batter. Add the baby corn pieces into the batter and mix it gently until all the pieces get a uniform coating. Meanwhile keep the oil for heating on medium- high heat. Now deep fry these battered pieces in batches until it turns golden brown on both sides. Once done drain them on a paper towel to drain excess oil. Continue deep frying with the rest of the baby corns. Then take a wide bottomed pan and heat oil in it. Then add garlic slices, chopped onions and sliced bell pepper and start frying it on medium flame. Sprinkle little salt at this point. Once the onion turns slight brown, add the soy sauce and mix well. Then add tomato ketchup and chilli garlic sauce. Give a good mix. Then finally add the deep fried baby corns and mix well. Let it get heated for a minute. Then turn off the heat. Sprinkle some chopped green onions. Baby Corn Manchurian is ready!! Serve it hot as it is or along with noodles or fried rice. Above measurement serves two people.